Dust in the Wind" is a song by American progressive rock band Kansas, first released on their 1977 album Point of Know Return. The guitar line for the song was written by Kerry Livgren as a finger exercise for learning fingerpicking. His wife, Vicci, heard what he was doing, remarked that the melody was nice, and encouraged him to write lyrics for it. Livgren was unsure whether his fellow band members would like it, since it was a departure from their signature style. However he did offer it to them, and the song was accepted and then recorded. 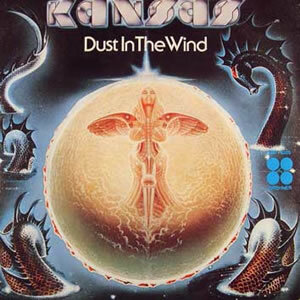 "Dust in the Wind" was one of Kansas' first acoustic tracks; its slow melody and philosophical lyrics differ from their other hits such as "Carry On Wayward Son" and "Point of Know Return". A meditation on mortality and the inevitability of death, the lyrical theme bears a striking resemblance to the well-known biblical passage Genesis 3:19 ("...for dust thou art, and unto dust shalt thou return. "), as well as to the famous opening lines of the Japanese war epic The Tale of the Heike ("...the mighty fall at last, and they are as dust before the wind. "), but the actual inspiration was from a book of Native American poetry, which includes the line "for all we are is dust in the wind." The guitar track comes from two guitarists playing six-string guitars in unison, one in standard tuning and the other in Nashville tuning, to create a chimy sound similar to a twelve-string guitar. The instrumental bridge contains a distinctive melodic line and harmony for violin and viola.